After Donald Trump's much-hyped October Surprise turned out to be an offer of $5 million to the charity of President Obama's choice if only the Commander-in-Chief would release his college transcripts, college applications, and passport applications to Donald Trump's satisfaction, Stephen Colbert had his own charitable extortion offer for The Donald: gargle my balls, sir. For charity. Yesterday's Trumpian demands were widely lampooned by everyone, and that part of the video announcement where Trump managed to make offers to support "inner city kids in Chicago" sound sneering and a little racist furthered my dark horse theory that Trump is actually a Democrat trying to shine a light on the utter ridiculousness of the current state of the Republican party. But because Trump pitched America a softball, America's jokesters had to take a swing. And no one takes better swings than Stephen Colbert. 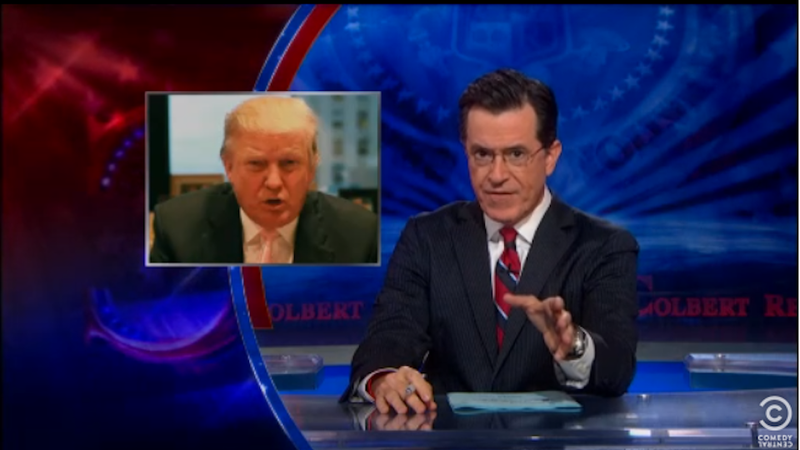 On his show last night, Colbert presented Trump with a counteroffer: let Stephen Colbert dip his balls into Donald Trump's mouth by 5 pm on October 31st, and $1 million goes to the charity of Mr. Trump's choice. Nation, I am so moved by this generous offer, that I have an offer of my own, right over here. Mr Trump, I will write you a check for $1 million dollars from Colbert Super PAC - you know I've got it - to the charity of your choice. Save The Children. Feed The Children. Put The Children on Child Apprentice, whatever. One million actual dollars, if you will let me dip my balls in your mouth. One million. But…this dipping - and I hope you're listening very carefully Mr Trump - this dipping has to be to my and more importantly, my balls' satisfaction. One caveat…My balls must be in your mouth no later than 5pm October 31st. My balls have a thing that night. Nothing would make me happier than to write this check. And nothing would make America happier than to have something going into your mouth instead of coming out of it. Ask not what your balls can do for you, but what Donald Trump can do for your balls. Mr. Colbert, you are a true patriot.